The dinasty of the Blingtrons begins here. Once upon a time there was an utility robot called Jeeves. He earned so much gold repairing players' gear, that eventually he covered himself with gold and became Blingtron 4000 and started giving away gifts, bragging about his opulence. Now, it appears gold isn't enough and he started an all-out battle with the other Blingtrons. There can be only one. Just like a Blingtron 4000, but 1000 more savage! "Yes. Engineers will be able to construct a new Blingtron (new gifts), and it will fight other Blingtrons to the death. Savage!" "Same faction. It will be a free-for-all. Idea is to grant a bonus to the creator of a winning Blingtron." 2- Assuming everyone leveled their blingtron 5000 (or that it has a fixed level to begin with), this would be an extremely boring fight that hinges mostly on RNG. Essentially you would win or lose depending on which pet abilities you picked in the first place, or if you miss or place crits. 3- If the battle took place within the pet battle interface, nobody would be able to witness it. Where's the fun in that? So my guess is the blingtrons are going to let each other have it UFC style with everyone in the room watching. Another random guess: Each of the two blingtrons involved will offer the daily account-wide gift quest, but obviously you can only get it once, and only the owner of the winning blingtron will get some kind of bonus gift from the daily quest. And if your blingtron loses, you will most likely still be able to get the normal daily gift from another blingtron. The idea there would be to actually encourage people to have their blingtrons fight! And when there is a sufficient amount of blingtrons on my realm, I will plan a massive fight with all the engineers in my faction and record it. I really want to see a 40-blingtron fight in Karabor. They say that after Blingtron 9001 destroyed Azeroth he started an era of peace and prosperity, but it didn't last and many centuries after his death a new enemy appeared. They called him Blingtron 40.000. In the grim darkness of the far future there was only war-craft. The Party is still going to be strong! Another silly and lame shining brightly gnome. Not again. Is that a cybernetic laser eye? Upon despawning will the Blingtron 5000 (aka Blingtronator) announce, "I'll be back"? Halfway through Warlords, Engineers will get a new model of Blingtron.. Blingtron 5000 S (or B5s for short)... Differences you may ask? He has a bigger hitbox. Currently bling 4k and bling 5k have separate 4 hour cooldowns. If you drop both they will fight and the 5k will destroy the 4k - it will also destroy other robots. They do share the same daily quest cooldown, so choose wisely if both are around. I didn't see any bonus from the 5k, but he did get a buff that made him 10% bigger and do 10% more damage per victory. The new and improved version of Blingtron 4000! On current beta build he costs 60 Gearspring Partss. On live release he costs 100 Gearspring Parts to make. He currently does NOT share a cooldown with Blingtron 4000, so you can place both down at the same time. If he is placed near to another Blingtron or other robot, he will attack it with bolts of lightning and with his hammer, until the other Blingtron is dead. NOTE: the other Bling becomes non-interactive on "death" and the corpse will despawn quickly. The buff Gold Star stacks on Blingtron 5000 for every other Blingtron he kills. @TheCrafticus @mumper Can you get the daily from Blingtron 4000 and 5000 in the same day? Or do you have to pick just one? @perksnpeeves @mumper You have to pick one. Seems like you cannot do both, meaning that there is no reason to build/use the 4000 vesrion. Here's a safety tip: Don't put any Blingtron(5000 and 4000 have been tested by me and my friends) inside of your garrison if you want your friends to be able to touch it. For some reason even if your friends are in your group, standing next to you, and it's your garrison, they can't grab the quest. I have found this out on 11/20/2014, so I expect in a future patch it'll probably be fixed, but just for the time being, don't do it! You can either take blingtron's 4000 gift package or blingtron's 5000 gift package. You can take 2 gifts per day. To note: do not set down another Blingatron near this if you want to let your friends loot it. As of current Blingatron 5000 becomes non-interactive to everyone after he has engaged anything and can no longer have the daily given. Blingtron 5000 only gives out gifts for the player that puts it down in their garrison. Killing Time is Blingtron 5000's normal countdown-to-departure buff, akin to Blingtron 4000's Party Mechanimal. If he sees another Blingtron, he attacks it, with Melee, Chain Lightning, and Whirlwind. (Poor 4000 only Melees, and misses a lot at that). If he kills it (as Ping mentioned) he gains a stack of Gold Star. Organic awareness of The War is growing too quickly. Above-ground units possibly infected. 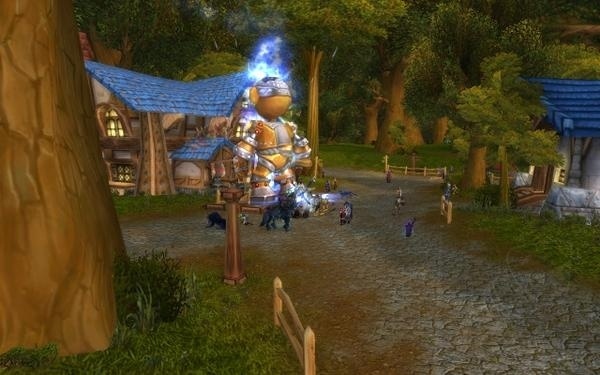 Seed plans for next-gen Blingtron remote to call on veteran units that can assess and destrory. It does not assault and demolish Jeeves. So you can vendor the junk/bank the resources you get right away. Has anyone managed to get his buff stacked to 10? The Blingatron 5000 is the same level as the engineer that sets it down. If yours is dying a horrid death like mine was (bless his little mechanical heart), it's because the higher levels are killing him. Most people may already know this, but it took me a while to figure it out. You can use this macro to print the location of the Blingtron 5000 to the chat. This one you need Macro Toolkit for, paste into your "MacroToolkit.lua" wich can be found under "\World of Warcraft\WTF\Account\ACCOUNTNAME\SavedVariables"
"There's a party in your heart and all the bladed weapons are invited." Blingtron 5000 Gift Package can contain Gearspring Parts which bind when picked up. So it's a good idea to do your Blingtron 5000 daily with a char that has the engineering profession. 5000 is 20% cooler than 4000. How do you repair it? I'm unable to get more than one stack of Gold Star because the fight leaves him damaged and weary. You'll take this gift and like it. I'll take it but I won't like it! Crashin Thrasin Robot gives stacks of Gold Star to Blingtron 5000 every time he kills one. 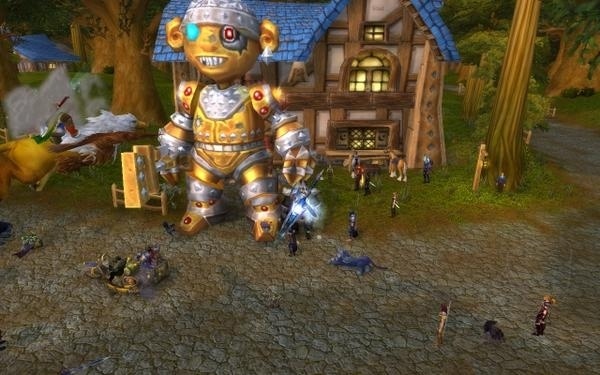 Unsure just how many stacks of Gold Star Blingtron 5000 can get, but would sure be fun if you could get everyone with a Crashin Thrasin Robot in Ashran to feed the Blingtron 5000 to see just how big you can get him. The crafted item is not consumed by using it, so u don't have to make a new one. When placed he will stay for his duration, even if you log out. I placed him, did the daily quest. Logged to and alt, and could not get the daily quest from him. There could be multiple reasons, but I haven't tested them. Blingtron @ maximum possible size (1000% of normal) I call him Blingzilla or Megatron. Achieved via spamming alts using the Crashin' Thrashin' Robot with 2 players doing it. We BARELY made it in time to get the screenshots before he despawned. In case you're wondering, it is possible to use Blingtron 5000 across factions. So if you want to start from scratch on the other faction, you can drop one, get the gift, and sell the junk for money. Bind-on-Use. Requires Goblin Engineering. Schematic is learned from Zap Farflinger in Everlook, Winterspring, - if you are a Goblin Engineer with 260 skill, he will teach it to you simply by speaking to him. Requires 260 skill to use. Bind-on-Use. Requires Goblin Engineering. Schematic is learned from Kablamm Farflinger in Area 52, Netherstorm, - if you are a Goblin Engineer with 350 skill, he will teach it to you simply by speaking to him. Requires 350 skill to use. Bind-on-Use. Learned from Schematic: Wormhole Centrifuge, sold by Nik Steelrings (Warspear)/Sean Catchpole (Stormshield), or the Engineering vendor in your garrison Engineering Works for 1 Secret of Draenor Engineering. Requires skill level of 1 to learn the schematic, but skill level of 500 to use the item. Hey just made this suggestion to Blizzard and wanted to get fellow engineer input on the idea. "I think it would be cool if with the next version of Blingtron the owner got 1 gold for each person that used it if the owner stays withing like 30 feet of it until it despawned. It could add up the total and mail it to them, that way if they do not stay there they get nothing. Another way would be that they just got the gold directly. Its not that much gold, so those that do not have much would have a way to get a little gold, but those that have a bunch would find it a waste of time." Do not see a list of items from this guy, but I got Geosynchronous World Spinner today. Finally paid off to click on him every day. Just got a Depleted-Kyparium Rocket from Blingtron 5000! I checked his loot table and it's not even listed as being a drop so I'm assuming it's a very low drop rate. Lucky day! Today bling 5k fought side by side with me. He moved around too. It was in my halfhill garden if that matters. I will try again to see if him fighting is a new thing.